The Thrive Programme® is an evidence-based training programme that gives people the skills and resources to overcome mental health issues and learn to Thrive. It is has proved to be successful with a huge range of conditions and problems including anxiety, depression, phobias (including emetophobia), OCD, stress, low self-esteem, social anxiety, weight issues, smoking, addictions and much more. The Thrive Programme® is very easy to follow, it takes only 6-8 weeks to complete and is accessible to all people of all ages. Based on scientific research, the programme enables you to understand yourself and how your mind works. It will teach you to realise that the way you think, feel and react to situations has a significant effect upon how you experience things in daily life. Going through the programme you will be taught how your beliefs and thinking styles are causing your symptoms and problems in life. After your training is complete, you will have all the skills, knowledge and understanding you need to effectively manage your thinking in any situation. YOU will be able to take control and make the required changes to put your life back on track to lead a happy and successful life. You will quite simply, know how to THRIVE in just about any situation. How was The Thrive Programme® created? In 2005 Rob Kelly – a psychotherapist with over 25 years clinical experience – began testing a variety of simple psychological interventions he had been developing, with the help of a researcher at Cambridge University. For some time, Rob had been disillusioned with traditional forms of therapy: they were often drawn-out, stressful and expensive for the client and all too frequently, not that effective. Despite this, he did however manage to help a number of people make incredible changes in their lives. Rob pinpointed exactly how they were creating their symptoms and problems and showed them how they could overcome them WITHOUT the need for therapy. Rob has mapped out the cognitive processes and thinking styles that are linked to the limiting beliefs people held about themselves and their lives. He is confident that it wasn’t the experiences of the past that causes the symptoms, stress, anxiety and conflict, but the BELIEFS about those experiences held in the present. 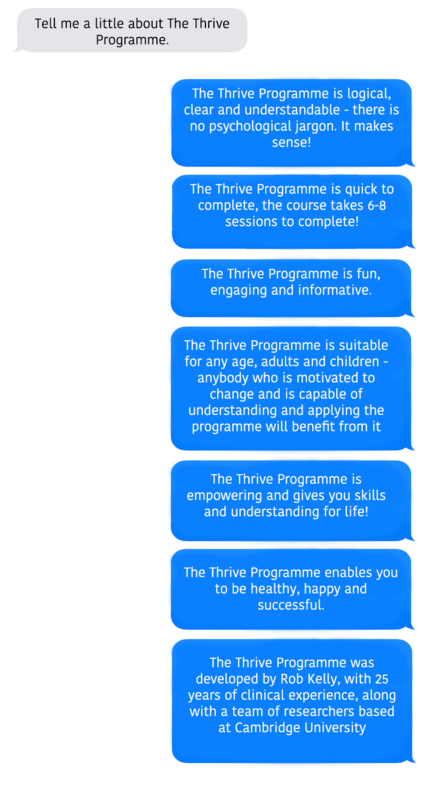 As a much more effective way to overcome psychological problems, The Thrive Programme®was born. Over the last ten years, Rob and his team have moved further and further away from the ‘medical model’ (waiting until someone is sick or ill and then trying to fix them) towards a ‘health model’ (giving people the skills and resources to manage their own mental well-being, so that they don’t become sick or ill). This is now the core element of the programme. Rob has now trained more than 100 Thrive Consultants® and with their help, tens of thousands of people all around the world are now living their lives to the full. Rob continues to undertake research and further develop his insights and skills. The Thrive Programme® is now being used in schools, prisons, organisations, businesses, psychiatric hospitals and sports clubs. The books are currently being translated into several languages. Created and developed over many years by Rob Kelly – a therapist with over twenty-five years clinical experience – and a team of researchers based at Cambridge University. The Thrive Programme® will teach you to realise that the way you think, feel and react to situations has a significant effect upon how you experience things in daily life. Going through the programme you will be taught how your beliefs and thinking styles are causing your symptoms and problems in life. After your training is complete, you will have all the skills, knowledge and understanding you need to effectively manage your thinking in any situation. YOU will be able to take control and make the required changes to put your life back on track to lead a happy and successful life. You will quite simply, know how to THRIVE in just about any situation. The sessions run alongside The Thrive Programme® official workbook which has all the information the trainee needs to achieve their goal including references to the evidence based research which supports the programme. BOOK A FREE INITIAL CONSULTATION TODAY! What does ‘Evidence – Based’ Mean? Evidence-based practice is ‘the integration of the best available research with clinical expertise in the context of patient characteristics, culture and preferences’ (APA Presidential Task Force on Evidence-Based Practice, 2006). Basically what this means is that our programme was developed – and continues to be updated – based upon the latest research studies into mental health, resilience and wellbeing. We have also conducted two of our own studies into the efficacy of the programme and are committed to continued research. Whenever new studies are published, we compare and contrast the findings in relation to (a) previous studies, and (b) our own studies. The programme is then regularly refined and updated based upon the best available research. An example of how research is at the core of The Thrive Programme®, is that a wealth of studies over the last few decades have demonstrated that building and maintaining an ‘internal locus of control’ or strong sense of control has a significant positive impact upon people’s health, self-confidence and wellbeing (e.g. Mirowsky & Ross, 1990; Cloitre et al, 1992; Abouserie, 1994; Gale, Batty & Deary, 2008). Additionally, increasing individuals’ perceived control significantly predicts recovery from a range of anxiety disorders (Gallagher, Naragon-Gainey & Brown, 2014). Psycho-education around your sense of control is key within The Thrive Programme®. The programme contains techniques and structured exercises to help you build your sense of control and become more ‘internal’. Engaging in evidence based practice is also about working with and listening to those who go through The Thrive Programme®. Thousands of people have already undertaken the programme and many provide feedback. So as well as our research studies, we have collected much anecdotal and qualitative evidence into the effectiveness of the programme. This helps us in continually developing the programme, ensuring that it is accessible and up to date. More information about some of the research that contributes to our evidence-base, can be found here. Almost every issue or symptom that a person can suffer from is driven by psychological and/or emotional forces. Our programme will teach you how to manage your thoughts, emotions and beliefs so that you are in control of your life. 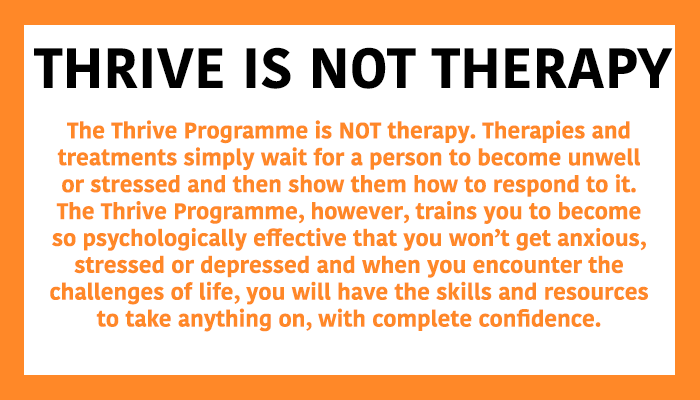 Let’s get one thing clear…The Thrive Programme® is NOT therapy. In fact, it is the polar opposite! Therapies and treatments simply wait for a person to become unwell or stressed and then show them how to respond to it. The Thrive Programme®, however, trains you to become so psychologically effective that you won’t get anxious, stressed or depressed and when you encounter the challenges of life, you will have the skills and resources to take anything on, with complete confidence. The journey to thriving is different for everyone, and we all have different starting points. You might have been suffering from a problem for years or have a new problem that you are finding it hard to deal with. The Thrive Programme® helps you to see a clear path forward that will not only enable you to overcome the problem, phobia or anxiety that you are currently encountering, but – even better – to go on to thriving. Clients completing the programme usually report feeling significantly better in a matter of weeks, and the programme is carefully designed to be easy to understand and easy to follow, ensuring your success. The Thrive Programme® is effective for people of all ages, and it has helped thousands of people to overcome a host of personal difficulties. Consultants are skilled in tailoring the programme so that it is effective for you, helping you to gain self-insight and to develop skills that are integral to the programme. The training takes on average 8-10 hours to complete, on a one-to-one basis. Most people spread the training over five or six weeks – give me a call to discuss your availability. How does this help me to overcome my symptoms? What is The Thrive Programme®?